Air-Dry Clay Fantastic for Fanatasy Artists - Alien vs Predator:- I actually using air dry clay for sculpting this sculpture, I wasn't sure what can I make with clay,it is just come to my mind as clay is certainly build something out of your imagination, I started to use Air dry clay recently, it was perfect the texture and the smoothness as it is soft and easy to control. This art is amazing! What a talent, and thanks for posting. If you would like to upload more views of this piece, go ahead and I will place on this page. Your post got me thinking - I need to make a section just for people to show their work - in all different mediums. Watch this space. Meantime, I have made the link live to your blog. A return link to this page would be good for my backlinks if you could. Many thanks. 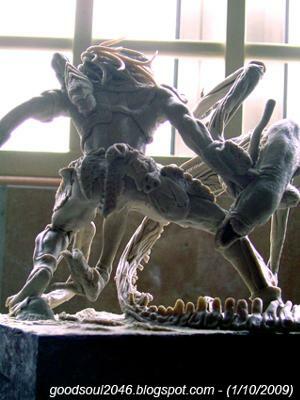 Hi, Its been some time since I posted my first work here with " Alien vs Predator". I have just completed my latest work - Oriental Dragon. I'm using air dry clay to work on this, cause it cured no too fast where you have more time to reshape it. Well I always wanted to make a dragon of my own version, I try to make the dragon look stronger and have longer limb to support the large body structure. I also added some LED to light up the eye , mouth and also the lotus beside it. I have also added some shinning sequin to make the scale of the dragon. It took me around 2 and a half month to finish this work, as I'm just using my free time to work on it. Hope you will like my work. Thanks for posting. Keep us updated.